I’m clearly training Mr. Baseball well, as now he’s started to spot tikis. He had this scene all queued up from “The Simpsons” for me to watch. In last week’s episode “Chief of Hearts” from Season 21 (wow! 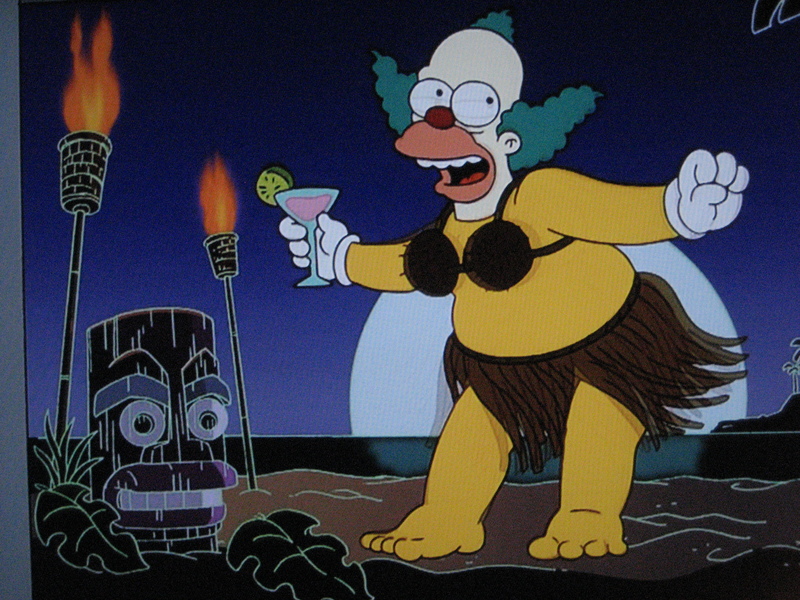 ), Homer and Chief Wiggum are watching TV when Krusty comes on the screen as a hula dancer in this “South Pacific”-esque number, complete with a Simpsons-style tiki! As my brother pointed out in my first post ever, this isn’t the first time “The Simpsons” has referenced tikis and it probably won’t be the last. Thanks for the shout out! Now I wish I hadn’t deleted that clip..
Yeah, it is definitely worth a visit!